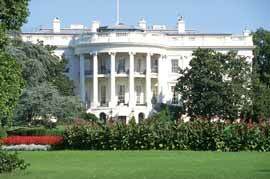 The White House, official residence and working quarters of the President of the United States. Photo from United States Department of Agriculture. Photo by Ken Hammond. The president leads the executive branch of the government. The president enforces the country’s laws and acts as Commander-in-Chief of the military. A vice president serves along side the president and may become president if the president dies or is otherwise removed from office. Presidential candidates must be 35 years old and must be natural-born citizens. The president serves four-year terms and may only serve for a maximum of two terms. This ensures that no leader acquires too much power. The president chooses fifteen trusted cabinet members to help manage the executive branch. The Secretary of Defense, the Secretary of Education, and the Secretary of State are just a few of the cabinet members who help the president make important decisions. Article II of the Constitution also gives the president the power to appoint ambassadors and Supreme Court judges, with Senate approval. The first president of the United States was George Washington. He served as president from 1789 to 1797. It is tradition for the president to live in the White House in Washington D.C., but George Washington wasn’t the first president to inhabit the White House. John Adams, the second U.S. president, moved into the newly built symbolic residence in 1800.